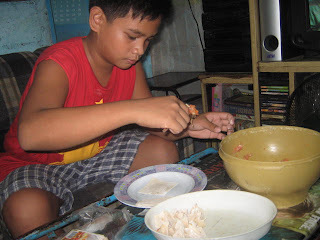 How to Make Siomai | To Be, To Be. Tutubi. 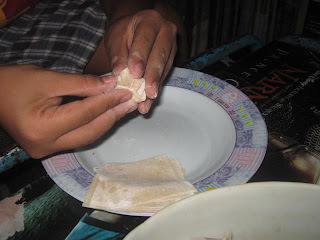 Yesterday, we decided to make Siomai as a snack. A neighbor sells them 4 pcs. for 10 pesos and we always end up wanting more so I said let's try and make them. 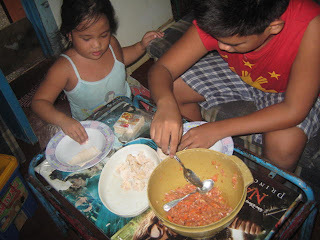 Making siomai is very easy indeed, the kids had fun while I take their pictures. Here are the ingredients: 250 gms. 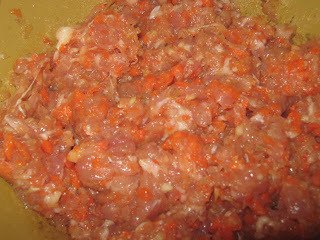 ground pork, 3 carrots, 2 onions, 1 egg, 1 pack siomai wrapper, salt and pepper. 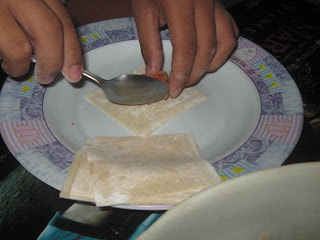 Those are almost the same ingredients for lumpiang shanghai. Then, just mix them all together. 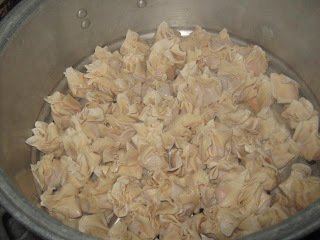 Then, steam the siomai for 20-30 minutes and serve hot. For dipping sauce, just mix some soy sauce and kalamansi. Add chili's if you want them spicy hot. I wanted to add some garlic to the dipping sauce just like they do in Siomai House, but I had no more time. I am sorry I wasnt able to take photos of the siomai on the serving dish. They were gone so fast even before I had time to get my camera. That was how good our siomai was. Of the ingredients above, the total cost was P88. We were able to make more than 60 pieces and had fun doing it and much more fun eating it! Hi,it's a very great blog. wow madali lang pala noh, thanks for sharing.. got here from rossel's page..
Love your blog title hehehe..
pwede! susubukan ko to one of these weekends. 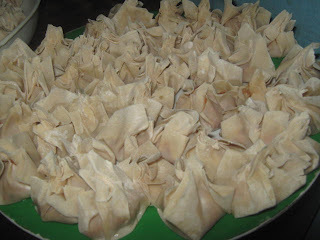 Tapos sawsaw sa toyo na may kalamansi, yummm..wahh, kaya ako hina high blood, ang takaw ko....Cute naman ng ma anak mo, gumagawa ng siomai. Oy ang mahal nyan sa SM ha, 4 pcs eh magkano 36 pesos? excuse me? I will make my own. Smart ka talaga....Have a great day..